Someone in my family has a sweet spot for The Boy. I bet not soon after reading last week's post about Carter getting into the memorabilia stash again, did one particular Softy begin to frantically find a solution to The Boy's scrapped football games. Carter received a special delivery today from the Postman. The sender was incognito, and no note was attached. But we figured we could pinpoint which of the Massachusetts relatives sent the package. How you ask? Because of it's contents. There are no Colts fans in my family that would have paid money for this, even if it was for a sweet 7 year old boy who cannot keep his hands off of his Dad's autographed football. So, it had to be from our Patriots side of the family tree. Carter was in heaven when he opened his delivery. He immediately ran outside to play with it. 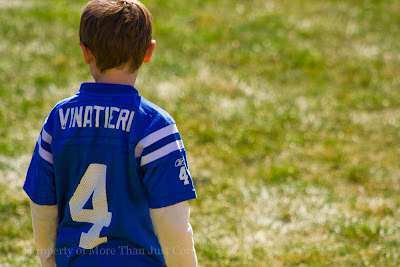 Before I could get my camera fired up, he rushed inside, flew upstairs touching maybe 5 steps and fumbled through his closet to find his #4 Adam Vinatieri jersey. 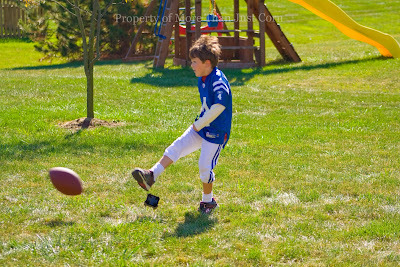 He wanted to be a kicker. 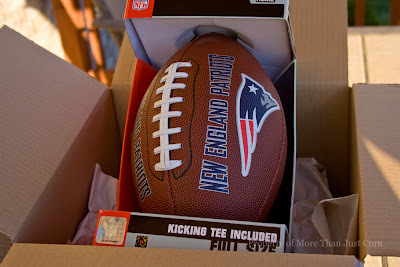 Because his new gift came with a kicking tee, and one must be in full gear when practicing right? It was all I could do to contain my giggles, when he finally emerged from his room, wearing the complete ensemble of a Colts player. Helmet, jersey, pants - he was serious about his game. And out he went. I had fun capturing the innocence of his youth, all dressed up and ready to tackle anyone who dared to enter the yard. 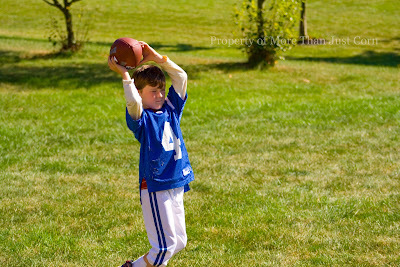 He spent the next hour being a quarterback, kicker, center and punter. Thankfully, he didn't feel the need to change jersey's each time. 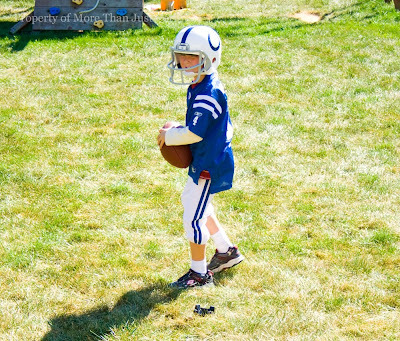 Considering the rivalry between the Colts and Patriots as teams (and my family split down the middle), it's pretty cute to see a kid dressed in one team's gear, playing with the opposing team's ball. 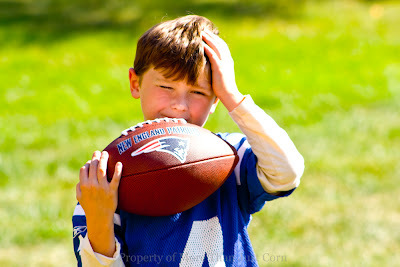 Now if we could just get Peyton Manning to sign his new Patriots ball.... that'd be funny, but then Carter would have to go back to playing with Nerf. Thanks John & Mary, you made his day! And that is just tooo cute! Glad he has his own football now!!! Andrea - I loved the pics - he looks like he is in heaven! Very sweet of your family to send...even if it's for the "other" team! A ball is a ball they say!!!! What you need to do is have both Peyton Manning and Tom Brady sign the ball, then you can lock it up in a glass case and hide the key. I want to know when you are taking that to a meeting to show Allison?? Click here to subscribe to my blog. Receive updates as they post. PLEASE SIGN HERE! Please take a moment to sign my guestbook and say hello! ~~~Thanks for reading! Does this look familiar to you? Is It Fall or Summer?